'Cutwally Gate at Gour'. Aquatint, drawn and engraved by James Moffat after Henry Creighton. Published Calcutta. Undated. bl.uk > Online Gallery Home	> Online exhibitions	> Asia, Pacific and Africa Collections	> 'Cutwally Gate at Gour'. Aquatint, drawn and engraved by James Moffat after Henry Creighton. Published Calcutta. Undated. 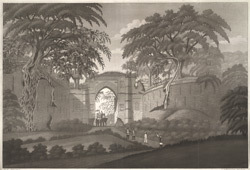 Aquatint with etching by James Moffat after Henry Creighton of the Kotwali Gate at Gour. The ruined city of Gaur was an ancient capital of the rulers of Bengal. It came to prominence under the Buddhist Palas from the eighth century, and then prospered under the Hindu Senas from the twelfth century. It fell to the Delhi Sultanate in the thirteenth century and later served as the capital for the independent Sultans of Bengal from the mid-fourteenth century till the sixteenth century, except for an interval between 1354 to 1442 when neighbouring Pandua was made capital. Gaur's decline began when it was sacked in 1539 by the Afghan ruler of Delhi, Sher Shah Suri. The Kirrani sultans who succeeded Sher Shah in the region subsequently shifted the capital to Tanda. The Ganga and Mahananda rivers, between which Gaur was located, later changed course away from the city and it was finally forsaken. Part of the fifteenth-century citadel of Gaur remains, along with its principal entrance on the northern side, the Dakhil Darwaza. A number of local and congregational mosques also survive in the area. Henry Creighton, an indigo planter living near Gaur in the late eighteenth century described the city, executed a number of superb drawings of its monuments. He found ruins of the city extending up to ten miles in length and one and half mile in breadth, lying between the Ganges and the Mahananda. The city had two big paved roads, parallel to the river, in the north-south direction, crisscrossed by smaller lanes and canals, some of which still exist. The Kotwali Darwaza marked the southern end of the city. Today it marks the border between Western Bengal in India and the Rajshahi district of Bangladesh. The gate has protruding turrets along the central arch tapering towards the top. The archway is enlivened with a motif of rosettes in terracotta.